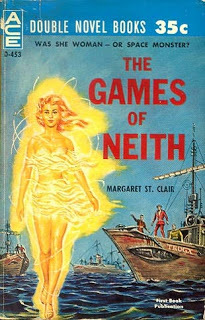 The Games Of Neith was released in 1960 as an Ace twin to Kenneth Blummer’s The Earth Gods are Coming. It’s one of the last whimsical science fiction novels Margaret St. Clair would write before getting down to the “serious” novel writing she began with Sign Of The Labrys. You do get the feeling from reading it that she was getting fed-up with all the rockets and ray guns of golden age SF. In the far future, humanity has settled on the planet Gwethym. Because of the religious riots which had taken place when the planet was first populated, the people of Gwethym have decided to worship an artificial goddess called “Neith“. Neith really doesn’t stand for much, but she looks nice and radiant on her pedestal and provides an outlet for religious sentiments. However, the followers of the rival god Jovis are still plentiful and long for the day when their deity will become prominent. The book begins with a discussion between the high priestess of Neith, Anassa, and her consort, Wan. Anassa has just survived another assassination attempt by a devotee of Jovis. There’s an “energy leak” taking place on Gwethym and the Jovians blame the worship of Neith for bringing it about. The energy leak (a vague concept) seems to have caused by spaceships using a hyper drive. Eventually Anassa and Wan take an ocean voyage to find the source of the leak. They are tipped off by some sailors who have encountered an old man living among ancient machines. Since the machines appear to be the work of the “old ones”, the humanoids who inhabited the planet eons before the humans arrived, they may hold the key to stopping the energy leak. I would classify this as the weakest Margaret St. Clair novel of the ones I’ve read. It has all the feel of something banged out quickly for the publisher. There are a few threads which seem to have been recycled from short story attempts. 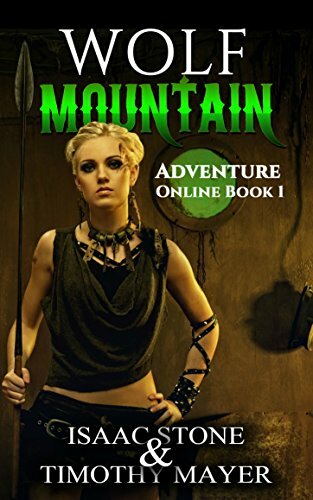 As Neith was published toward the end of her productive short story career, this may have been the result of trying to merge several ideas in a coherent whole. One for Dame St. Clair enthusiasts only.